The Cult sold out show at the Music Hall in Aberdeen was the hottest ticket town, having been sold out for quite a while. They were promoting a new album called "Hidden City" and this was their first UK tour in 3 years. It was also the first time the band had played Aberdeen in 29 years. The festival is four days long and centres around the Camden area of London. With many shows and exhibits over the festival, it is hard to catch it all. Here some of my highlights. A good family all round fun night out. There was plenty of diversity in the acts with jugglers, acrobats, clowns and tight rope walkers. Children loved the funny bits and the constant stream of one act after another. Adults were wowed by awesome feats of agility and daring. One of this year's headling acts was causing a major controversy - Metallica, a brave choice by Michael Eavis. Heavy metal was coming to the Pyramid stage, where so far no metal band had graced the stage. The previous day lightning had forced the closure of some area, but when Metallica took to the stage there was electricity in the air. Very hot and got hotter over the weekend. Ended up over 100 degrees by the end of the festival. At least there were bars with fan misters in an attempt to keep people cool. Big congregation of punks (black clothes in the heat was not great!) average punters walking around Downtown were surprised by the amount dyed and spiky hair styles! Aberdeen’s bearded community came out in force to see what The Beards were all about. The band certainly lived up to their name, with 3 albums all about beards and a new one on the way it was no surprise every song was about beards! The Zombies, Animals & friends, the Yardbirds, Maggie Bell, and Dave BerryWith this amazing line up that has had up to 37 hit records in the uk charts for over 300 weeks you are guaranteed an unforgettable night. And we wasn’t disappointed. 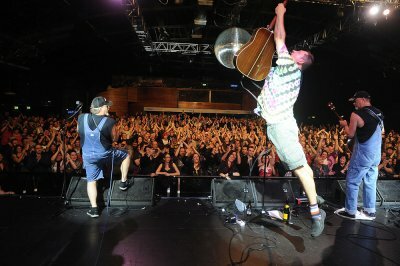 2014 Started with me getting an email from the www.thepopcop.co.uk to say i had won there annual Scottish Music photo of the year award, with my photo from Hayseed Dixies 1000th show in Glasgow. Aberdeen we have a cracking show coming to town, if you’re looking for a good night out to be on the 15th Feb, the music hall is the place to be.